" Trina Solar Limited (”Trina Solar” or the ”Company”), a leading integrated manufacturer of photovoltaic products from the production of ingots, wafers and cells to the assembly of PV modules, founded in 1997, today announced a cooperation agreement with LISA Airplanes for the building of the Hy-Bird, a solar and hydrogen powered airplane that is set to be the first to fly around the world using only renewable energies as fuel. Under this agreement, Trina Solar will supply LISA Airplanes with almost 300 photovoltaic cells for the assembly of this hybrid airplane. The solar PV cells on the wings and horizontal tail of the plane will supply sufficient energy to complete the fuel cell power for takeoff and for on-board power supply. Apart from this, the plane will be propelled by an electric engine, more silent and more effective at high altitude than heat engines. 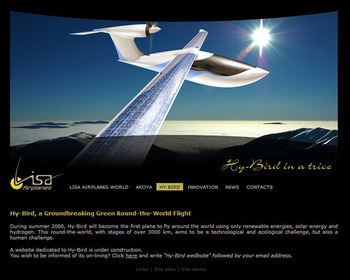 LISA Airplanes has already produced a scale model and expects to complete assembly of the real plane by the end of 2009. LISA Airplanes expects to make a series of full-scale test runs and introduce the Hy-Bird project, its technologies, its values and its partners in several countries where interest in renewable energies is growing rapidly. The Hy-Bird is expected to take off for its around-the-world flight, from West to East, through various stages of approximately 1500 kilometers. ”We are pleased to have reached this co-operation agreement for the construction of a solar airplane, since it is a pioneering project and represents a unique and innovative photovoltaic application that underscores the high quality and reliability of Trina Solar PV products," remarked Arturo Herrero, Trina Solar's Vice President of Sales & Marketing. "We are very proud to be part of this sustainable energy airplane project as we continue to promote the benefits and use of solar energy worldwide”. "